Japanese Studies, tourism studies and photography studies came together on 19 September at the Japanese Studies Centre Auditorium where we heard Dr. Daniel Milne (Kyoto University, Japan) speak about his ongoing research into the visual and textual discourses of military guidebooks produced by the American Military in the early Occupation period. 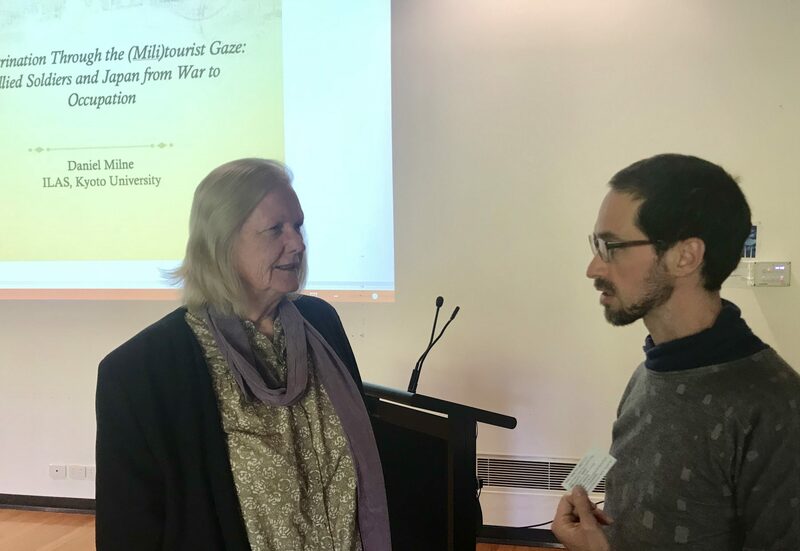 Thanks to Professor Robin Gerster of the Literary Studies Program (and a travel writer and photography studies expert himself) for his help in setting this event up! Abstract: What are ‘tourist media’ & guidebooks? What has their role been in shaping ideas, desires, expectations & encounters in tourism? How do they frame ‘self’ and ‘other’? Did Japanese authors fulfil, manipulate or contradict orientalist gazes of Japan through locally-produced guidebooks? Why would an army utilize the format and discourses of guidebooks in materials designed to represent a foreign enemy? In the 19th century, tourism becomes a key transcultural space through which people learned about and personally encountered cultures different to their own. It also influenced people’s construction of their own cultural and national identities and – on occasions – allowed some people to represent these to an international audience. Tourist guidebooks, therefore, became important media in defining and understanding – as well as influencing – ideas of the ‘self’ and ‘other.’ In order to explore such dynamics of representing ‘other’ and ‘self’ in guidebooks, two vastly differing ‘guidebooks’ are compared: one presents a positive self, another an evil other. The former – written in 1873 by Yamamoto Kakuma – was the first English guidebook exclusively about a Japanese destination, while the latter – a 1945 pocket guide booklet to Japan – was written for US soldiers who fought against, then occupied, Japan. Through this comparison, Daniel attempts to answer the questions above and considers guidebooks as mediums of education/indoctrination about cultural others. 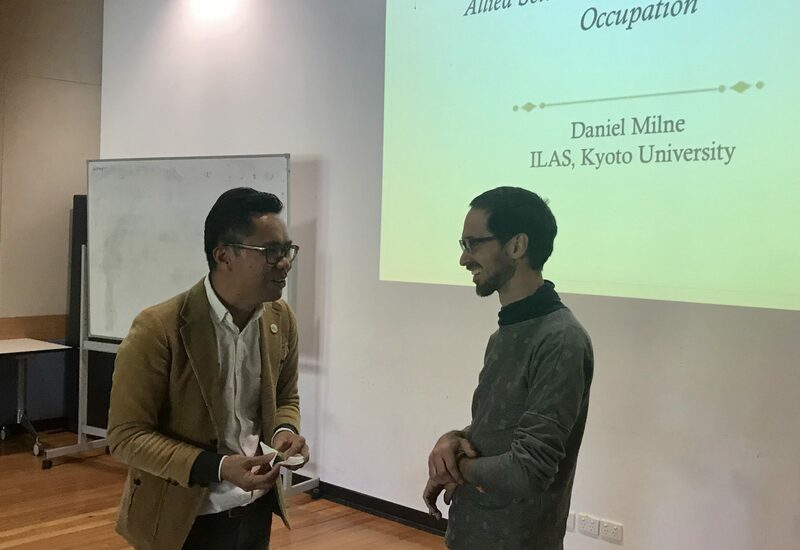 Daniel Milne gained his PhD from Kyoto University’s Graduate School of Human and Environmental Studies and is currently a lecturer at Kyoto University’s ILAS Institute. His research looks at how tourism creates spaces of intercultural encounter, produces media representation of self and other, and can be a path towards (mis)understanding other people, nations, and cultures. Specifically, this research has focused on transformations in touristic discourses of Japan, the birth of international tourism in Kyoto, and the political and cultural role tourism has played in war and occupation. 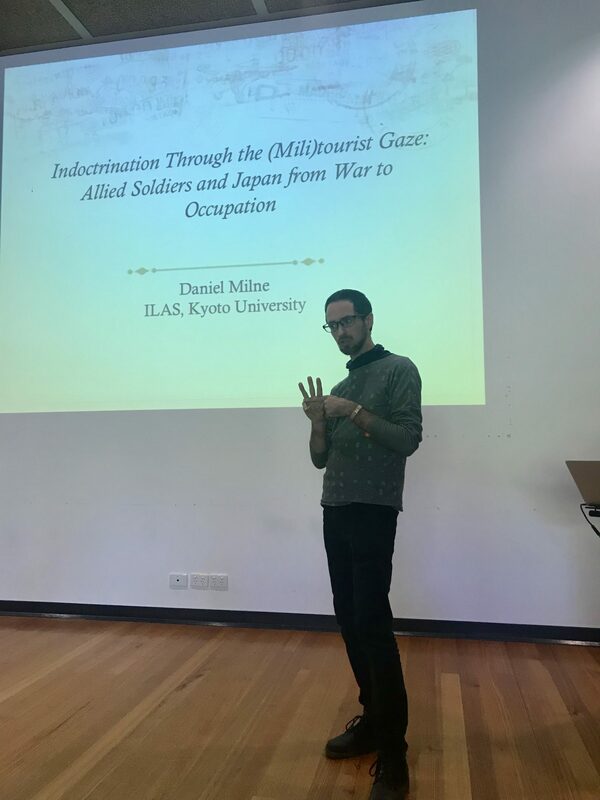 Daniel is currently co-editing a Japan Review journal special issue on the relationship between tourism and war in modern Japan, scheduled for publication in December 2018.